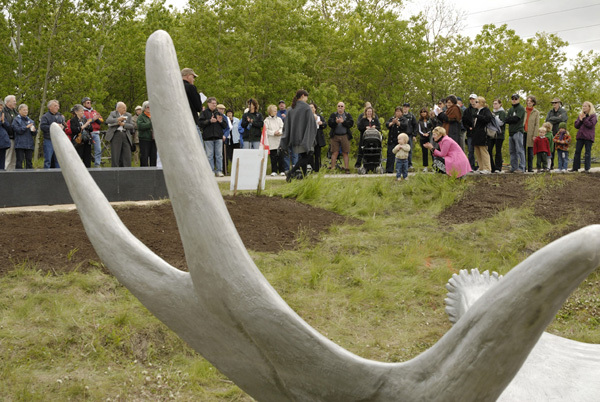 The Winnipeg Arts Council issued a national call for an environmentally-based artwork to be integrated into the Bishop Grandin Greenway, a major green space enhancement, active transportation route and community recreation project in south Winnipeg. 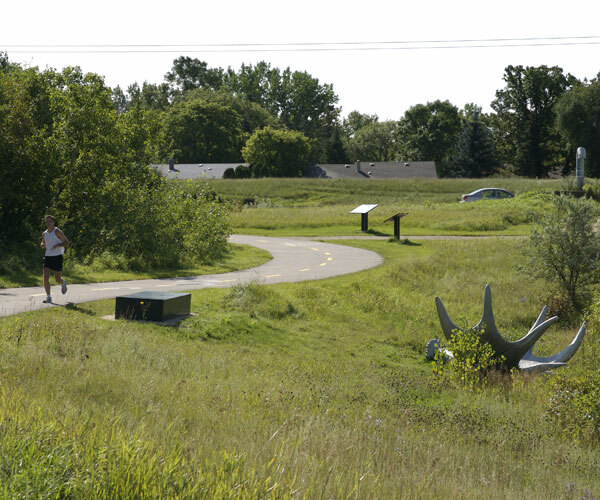 Prior to the greenway project this ~500m wide corridor had become dedicated to several hydro lines, an underground aqueduct plus feeder mains, a four-lane, divided suburban highway and several storm retention ponds. The area is historically rich and it is believed that the current pathway has been used as a corridor for over a hundred years. Riel House, the home where founder of Manitoba, Louis Riel, grew up is located nearby. In the past, the area was known for mink ranches and market gardens and is now increasingly densely populated. 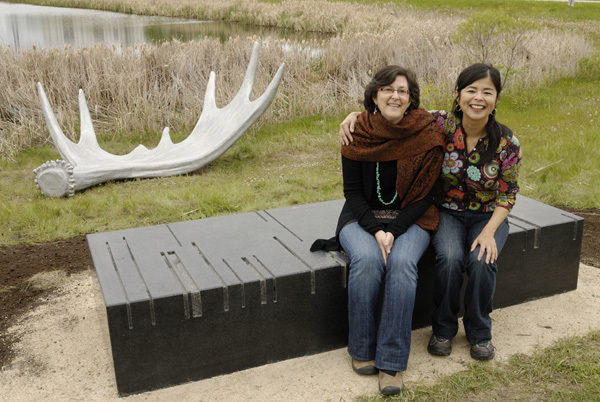 Artists Nancy Chew and Jacqueline Metz were selected for the project. 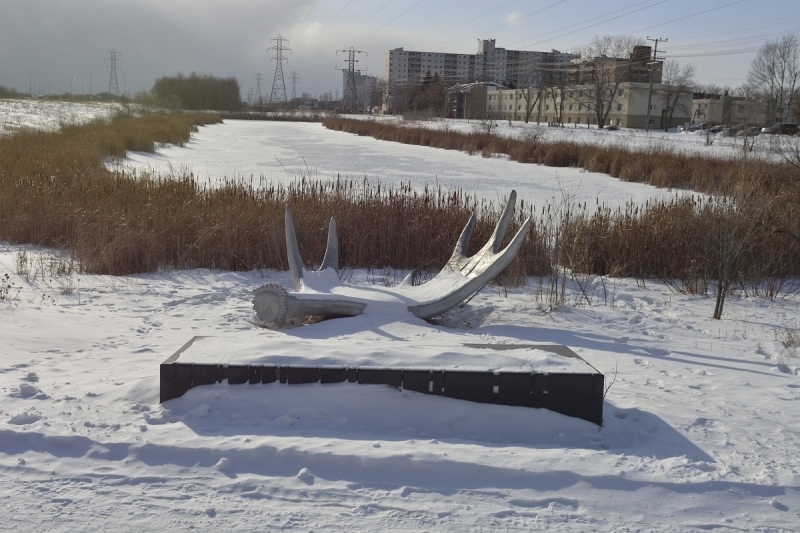 The artists worked with the volunteers of the Bishop Grandin Greenway to understand and research the history and current uses of the greenway area. They developed a proposal based on the imprints left on the landscape by both animals and humans. 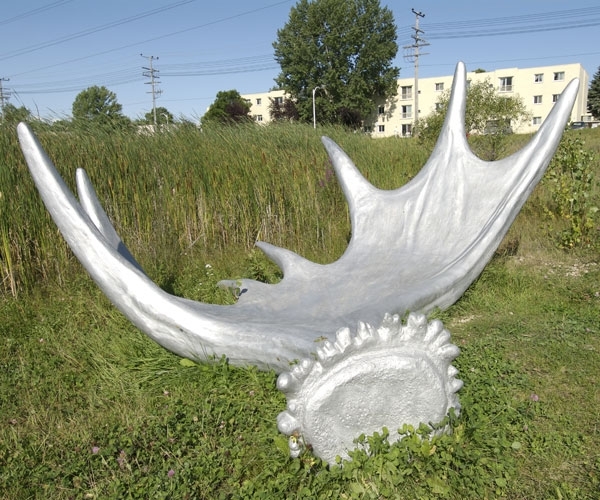 The final artwork, land/mark is comprised of a large aluminum sculpture inspired by an actual shed moose antler as well as a granite bench inscribed with a linear pattern that reflects on the historical “long lot” system of land division common to the area, and to the rivers, an important element in Winnipeg past and present. 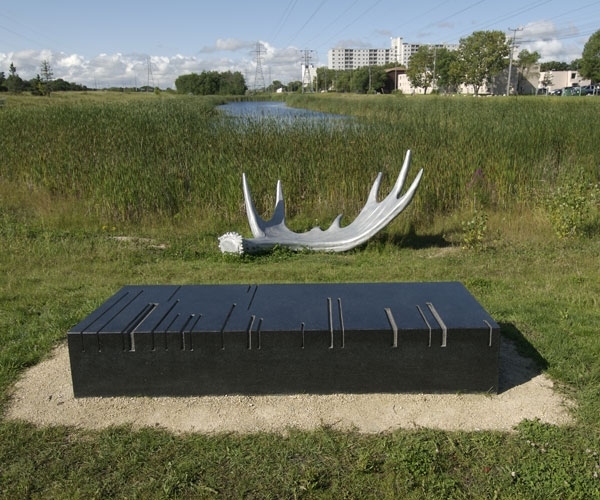 Nestled between the edge of a retention pond and the path, and across from a wooded area, the piece offers a contemplative space. The sounds of blackbirds and woodpeckers, as well as traffic from the nearby highway, are in the air. Hydro towers mark the sky like drawings, people cycle and stroll on the path, butterflies flock to the indigenous plants. These divergent elements reinforce the complex contemporary relationship between humans and their environment while leaving open the opportunity to ponder the past. “We were thinking about what might have been here at one time - and about what has changed. The imagery recalls the long past natural landscape, and refers to the early settlement of this area - to those first marks made on the land. There are two components, each an overlay of nature and culture. The first is a block of stone - an invitation to rest. It is abstracted by geometric form and markings on the surface. The markings suggest the divisions of cartography and the seigniorial system, and imply the presence of the river, the minimal lines interrupted by the memory of the curving stream of water. 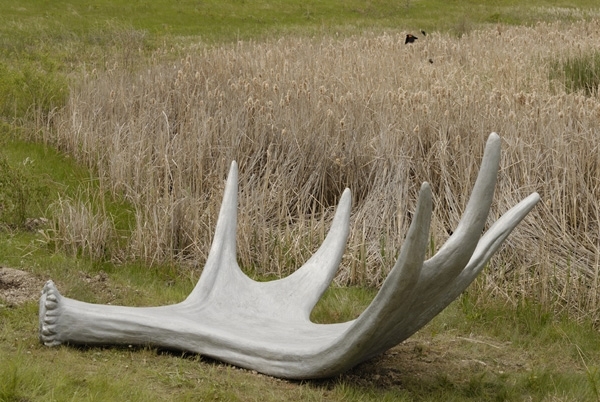 At the edge of the pond is a monumental shed antler, as if shed by a mythical moose. 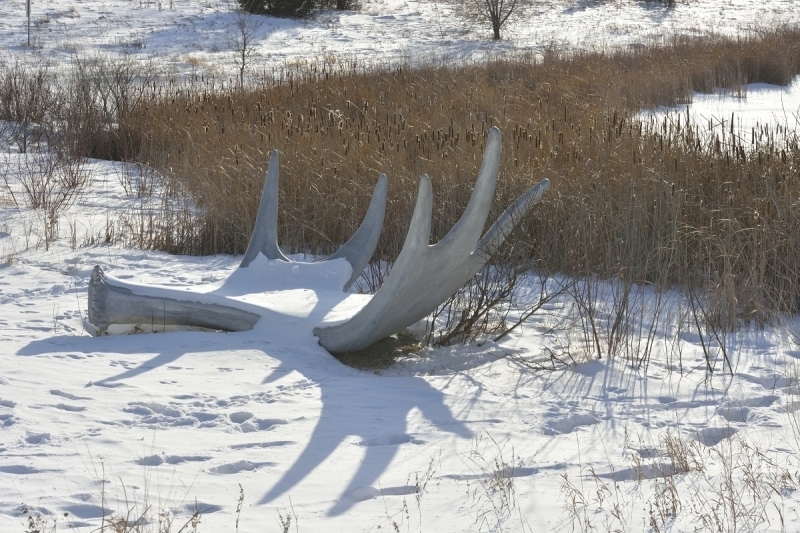 There is something both magnificent and endearing about the moose. 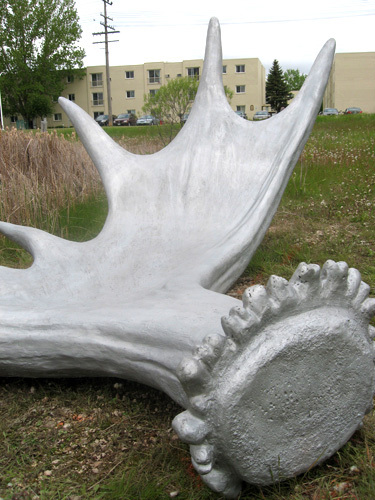 It is a symbol of the wilderness, and was part of early life in the region. 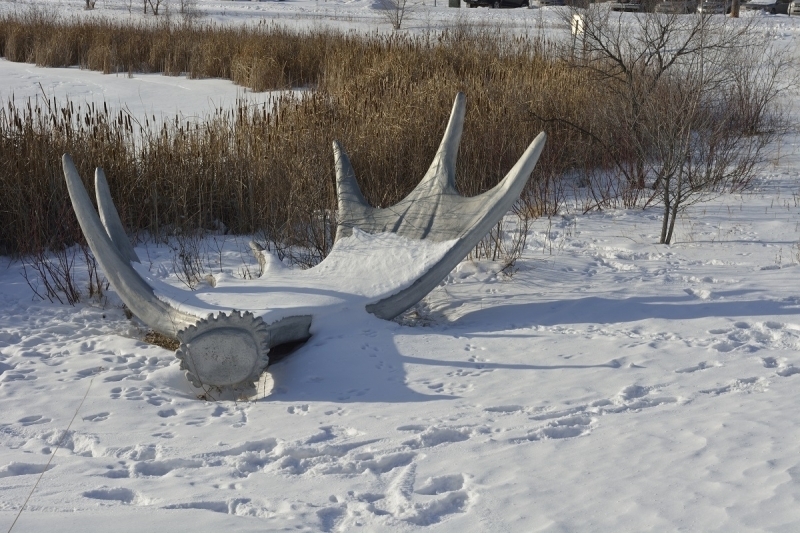 Red River Métis and First Nations hunted moose for food, clothing, and rugs, and the moose was incorporated into the crest of the Hudson’s Bay Company. The gentle curve rests like an open hand, directing our gaze over the thick rushes, flittering birds, rippling water, and the delicate line of hydro towers receding into the distance. 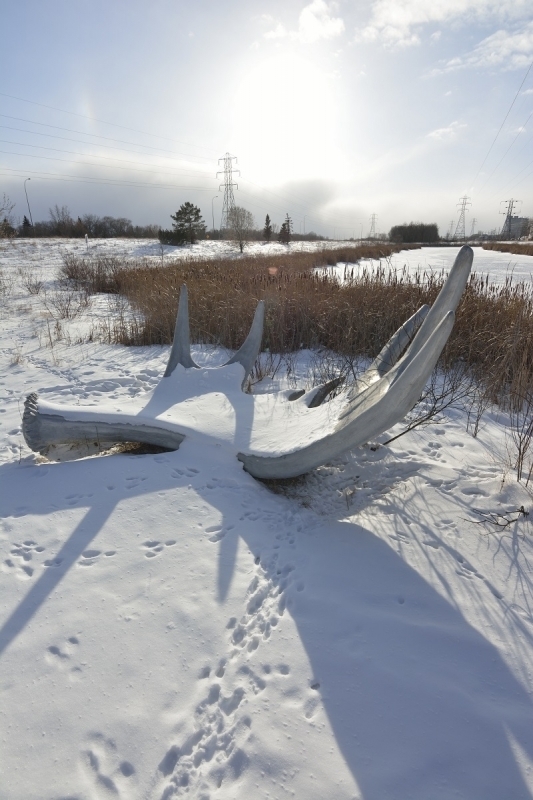 In the winter the sculpture will be transformed by snow, an enigmatic form rising above the landscape, casting shadows.